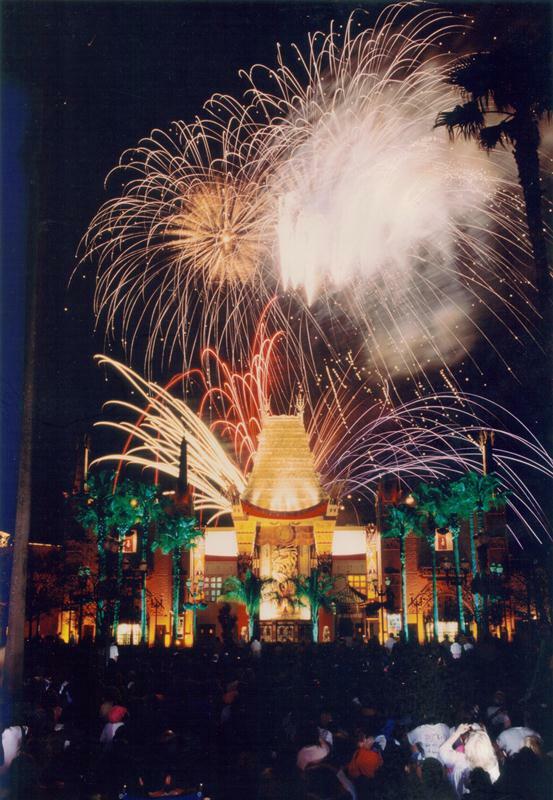 Fireworks over the Great Movie Ride – Chinese Theater are always a fun throwback sight. Generally only seen a couple of times a year, at Fourth of July and New Years’, this display happened to take place on the Fourth of July in 1996. Notice the lack of the Sorcerer's Hat in this view. While we love the spectacle of fireworks, let’s remember what these represent to the Fourth of July. The Star-Spangled Banner, was written by Francis Scott Key with the original title of Defence of Fort McHenry and describes a critical 1814 moment in the War of 1812. On September 13, 1814, British ships began bombarding Fort McHenry in Baltimore, MD. The shelling continued for 24 hours, but in the deep dark hours of September 14, the light generated from the explosions illuminated the flag of the United States that still billowed across the sky. The Battle of Fort McHenry resulted in the death of 4 soldiers and the wounding of 24 more, and was part of the larger Battle of Baltimore. Yet, the staunch defense of the small fort offered such a stirring image that it was immortalized in words and enshrined as our national anthem by Congress in March of 1931.